Well if White Water Rafting has always been on your Bucket List now is the time to get it ticked off. Like I am sure many of you this was always on my must do list, however unlike many of you I choose to do it on a snowy day in December with temperatures of -1°C. So it was off to meet everyone at Ace Adventures and get into a wetsuit – well actually into thermals, 2 wetsuits, 2 neoprene jackets, 1 dry jacket, neoprene socks and boots, hat liner, hat and gloves – all brilliantly provided and presented by Ace along with lots of help getting into the right sizes. Then down to the river where Jack our guide got us all seated in the raft and gave us our induction – basically do what he says – he if says hold on and get down just do it! I was certainly feeling very apprehensive at this point but it was noticeable the bus had disappeared and there was no other way to get home. So into the raft we went and out on the River Findhorn. 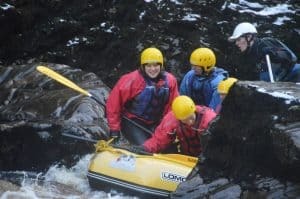 It is worth pointing out that the Findhorn offers the world-class white water rafting with Grade 3 or above rapids that I did not know until after my adventure was over! The Findhorn River is beautiful as it winds through gorges of granite and serpentines through rocks before coming upon walls of red sandstone near the bottom of its journey. Valley and gorge walls are lined with mature deciduous and coniferous forest. In the main gorge and with a light snow falling the scenery and tranquillity were stunning. At points along the river we had to get out of the raft and traverse the rocks to pick up the raft a little bit further down as the water. This gives you the chance to see the formation of the granite rocks and you feel super fit as you pothole back down to the raft – even a little bit smug as people on the bank watch your antics. At times the river narrows so much it is a wonder the raft can get through – one example is the dramatic Randolph’s Leap – ancient stories abound here of rival clans and this being the narrowest point of the River for crossing. Therefore imagine my surprise when I realise we would be rafting through this point. I have walked the riverbank here many times and admired the dramatic steep cliffs and watched the torrential river rushing through, now I am a part of it. At this point I was definitely feeling smug as people were waving to us and running along the River bank to photograph us and I am wondering do they realise I have never done this before? So on we go with Jack telling us about the Rapids coming up with names such as Side Winder, Triple Falls, Cork Screw, and the Slot. Time is spent viewing the approach to the Rapids, the four of us were a real team by then following instructions, whizzing through Rapids that were nowhere near as bad as they looked or the names sounded. Andrew checked out the rapids ahead of us in his canoe and took photos to record our trip. 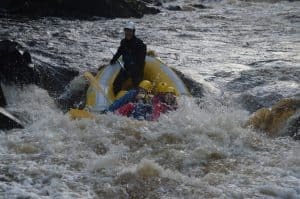 So if you have White Water Rafting on your Bucket List and you want the real feel of adrenaline and accomplishment that a real river can provide then you need to book this trip. 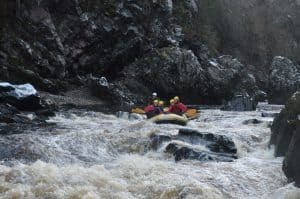 The safe capable hands of Ace Adventures give you a real taste of the Findhorn and like me you will want to go back for more. Riding the rapids – great feeling.